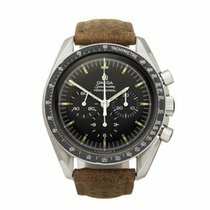 This is a pre-owned Omega Speedmaster 'straight writing' men's 145.022 watch. 42mm case size in stainless steel, black baton dial on a brown leather bracelet, powered by a mechanical wind movement. This Omega is in good condition complete with extract from archives only dated 22nd September 1971. Our Xupes reference is W5573 should you need to quote this.